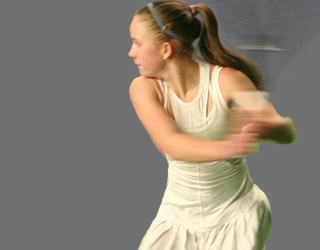 Alexis Prokopuik, above, ousted top seed Tracy Dong, 6-1, 6-2, in the Girls' 16/18 Champ's final on Sunday, January 15. Alexis later teamed up with Stacey Fung to overcome Tracy Dong and Rosie Johanson in the Girls' 18 doubles final, 6-1, 6-2, to claim the title. Photo 1 (left): Tracy Dong is practicing no more than one hour per day on average and is studying more at the school. Her education has gained in importance for now. Photo 2: In the Boys' 18 Champ's final, Alexander Day beat Patrick Walker, 6-1, 6-4. Alexander and his partner Zach Lidster topped Daniel Raw and Roy Cheng, 7-6, 6-1 for the Boys' 18 doubles title. Photo 3: Cassie Chung, left, and Jared Maclean. They are the winners of this year's Sportsmanship Award. Cassie also took the Girls' 14 title by beating Khadija Dumas Da- Silva, 6-1, 7-5, in the final. Photo 4: The coaches: Dimitri Penchev, left, and new Tennis Canada coach Oded Jacob. Oded, who hails from Israel, was recently chosen to run Tennis Canada' s third National Training Program following centres in Ontario and Quebec out of North Shore Winter Club. Can Oded fill the gap and help our top juniors now that Luke O'Loughlin has left Tennis BC out of frustration and, in doing so, left BC without a director of high performance? We hope so. Photo 5: Lauren Li, left, and Oleksandra Gorchanyuk. Lauren outlasted Oleksandra in three sets, 2-6, 7-5, 6-3, in the Girls' 12 final. Photo 6: Top seed Neel Phaterpekar, left, and Manroop Gill. Neel fended off Manroop, 6-3, 7-5, to win the Boys' 14. Photo 7: Jerry Huang, left, and Andre Sobati. Jerry beat tired Andre, 6-3, 6-0, in the Boys' 12 final. Photo 8: Meet the winner of the Boys' 16, Tejas Phaterpekar. Tejas defeated Felix Fan, 6-3, 7-6, in the final. Photo 9: Sam Gouneili (left), winner of the Boys' 14 Consolation, is receiving his prize from Tennis BC's Lois Ker. Sam beat John Schriemer, 6-2, 6-1 in the final. The Champ draws, this year, were limited to the top 16 players in Boys U12, U14, and Girls U12, U14. This format was also used for the top 12 players in Boys U18, for the Girls U16/18 combined, and for the top 16 players in Boys U16. Instead of consolations, doubles were included for these events. All other players played in the Challenger draws.